What was lost in the publishers’ lawsuit and its ultimate disposition was something called the Book Rights Registry, which Google was going to fund and which would have been the authoritative source for determining copyright control of book content. A big issue for publishing remains how to handle “orphan” works: books for which the true current copyright owner either can’t be found or can’t be definitively determined. These books are effectively in “limbo” which makes it risky for anybody to publish them. Their “orphan” status means their commercial value is ambiguous. (And even when publishers are clear that they “own” the rights, it isn’t always clear what rights they own! Or, while they may unambiguously own the rights, they can be stumped because no specific ebook royalty has been stipulated.) But with the solution Google had in mind, the intellectual value of books whose copyright control was ambiguous could still be realized. Not now. The email-list discussion was not conclusive on an important point. Everybody agreed that Google ultimately lost interest in the program. The question was whether that was all Google’s fault, or inherent to Google’s nature, or whether it was because the publishers made what was a labor of passion — getting all the knowledge in books indexed and accessible — for Google’s top management just more trouble than it was worth. My points of context for Google weren’t in publishing; they were in tech. My own most extensive experiences with the big three tech companies that publishers dealt with — Amazon, Apple, and Google — was working out their participation at publishing conferences, which I did a lot of between 2005 and 2015. At that time, Facebook was largely nascent (not as important to publishing, although it surely would be now) and Microsoft a bit past its dominance. Of course, that was the view only from the perspective of a conference organizer recruiting speakers. When David Young was running Hachette USA in the last decade he made a very telling point that this all recalls. He had been running publishing companies in the US and UK for three decades. He said he was always able to get the CEO from his largest accounts on the phone if he had an issue of major magnitude. Now Amazon had been become his largest account and that was not the case. Amazon was the first piece of evidence — and still the most important piece of evidence — that the old world has disappeared. (Some relevant ruminations on this point from six years ago.) They sell more than half of the books for most publishers, but all the books they sell probably amount to less than 5 percent of their total margin. And while Penguin Random House may be in the neighborhood of half the consumer book sales overall, they wouldn’t amount to nearly that big a percentage of Amazon’s book sales because Amazon gets a disproportionate share of professional and other niche markets and thus from publishers who don’t compete at all with PRH in the consumer market. 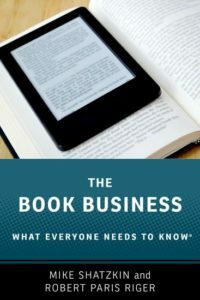 Of course, the book business occupies the same relative lack of importance to Apple and Google, and would to Facebook or Microsoft or Instagram or any other tech company. All of which leads me to two conclusions. One is that when a tech company like Google offers the book business what appears to be an opportunity, the industry needs to take seriously the notion that the opportunity may be fleeting. They don’t need us. In retrospect, it seems like publishers thought that their content was more valuable to Google than it actually was and that their position to dictate the terms by which the content would be made available was much stronger than it actually was. And the other is that it just might be that Google, Apple, and Amazon are good partners when they’re dealing with entities that have more relative importance to them than each of us in publishing does. Publishers individually and collectively have existential importance to Ingram, Baker & Taylor, and Firebrand. Publishers are their raison d’etre. Publishers will never get the level of engagement and bandwidth from the tech giants than they will with the industry-focused companies in our vertical. And they shouldn’t expect it.